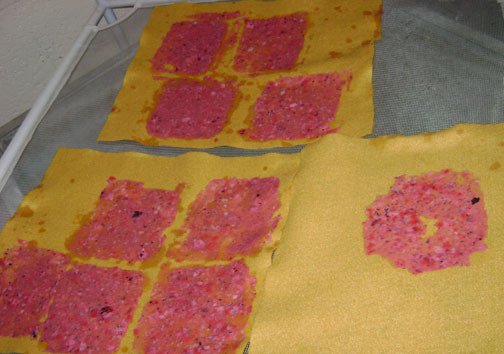 As I've probably mentioned, I'm doing Festibooks this Saturday, and I'm signed up to demonstrate (although, it wasn't specified what), and after racking my brain forever for something neat and unusual that doesn't require a lot of $$, I finally thought of paper making! Like a week ago. But, despite the rush, it's perfect. 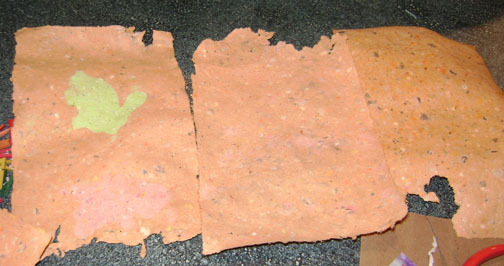 I have all the stuff already, as I went through a phase of obsessive paper making some years ago (3? is my best guess). But I had some kinks to work out, especially with the "giving the kids something to take home" part and after watching some YouTube videos and having done some experimentation, I've hit on a manner of making it work. Which is ironing! 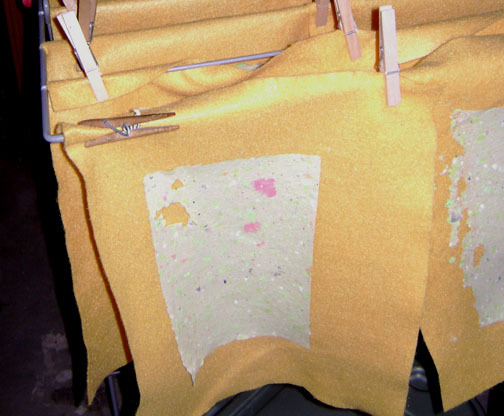 With an iron, you can go from an empty deckle and a tub of pulp to a half sheet of paper in about six minutes. It won't lie flat, but it's paper! for the record, that's a bunny. They're not strong enough for the iron, we have to wait. It works fairly well for something that probably shouldn't work at all... I mean, I wouldn't give up my proper molds and deckles in favor of a blueberry container, of course, but for someone who just wanted to do it once or sometimes and not buy the fancy equipment, (or make it, as I did) it might be reasonable. However, one still has to use a blender, and I'm not sure you can get around that.